Some MacOS High Sierra users have reported issues with wireless networking after updating their Mac to the latest system software version. The problems may range from difficulties connecting to wi-fi networks, dropping wi-fi connections (particularly after waking from sleep), sluggish wireless speeds, and other frustrating connectivity problems with wi-fi networks. This article will attempt to detail some common problems, and explain some troubleshooting steps to resolve wi-fi issues with macOS High Sierra. Before doing anything else, if the Mac is currently on High Sierra then you should update to the latest version of macOS High Sierra that is available. Apple regularly releases software updates to system software, and macOS High Sierra is no different. If you are still running macOS High Sierra 10.13, then you need to update to the latest point release version available (10.13.1, 10.13.2, etc). This is easy, but you should always backup a Mac before installing any system software update. The bottom line: check for available system software updates and install them if any are available. Is the Wi-Fi router SSID (name) hidden? 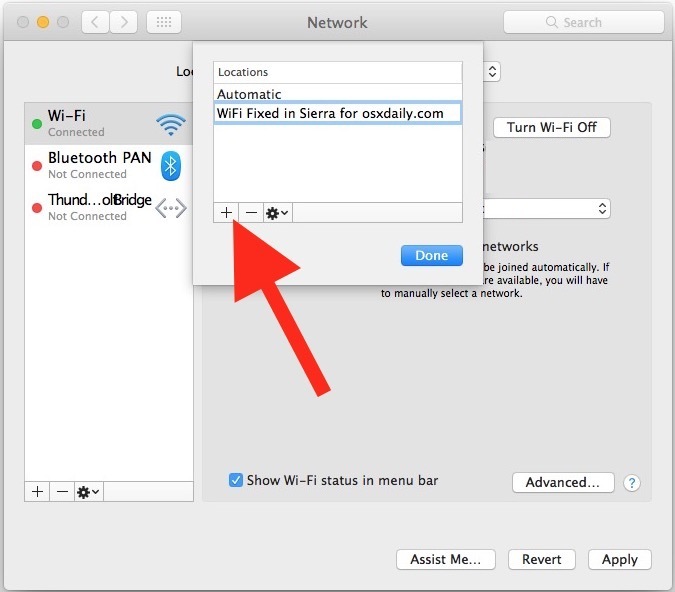 Some Mac users with MacOS High Sierra have reported difficulty connecting to wi-fi access points that have a hidden SSID. 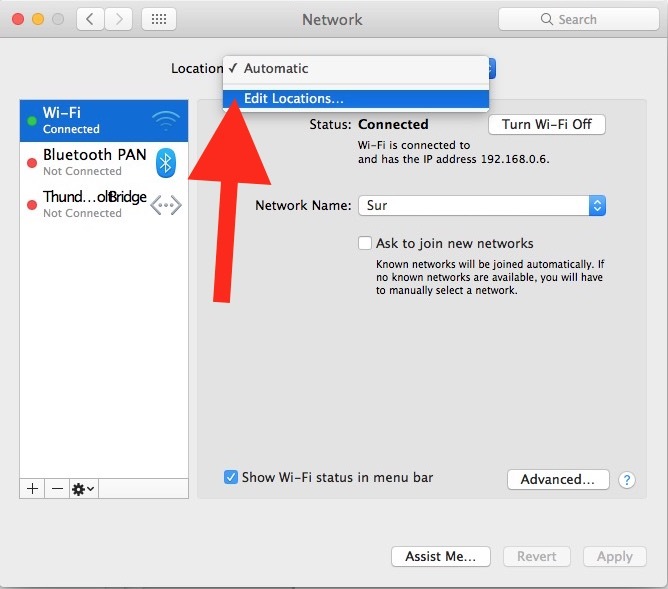 You can try disconnecting and then connecting directly to the hidden SSID router in Mac OS, but the connection may drop again or fail upon waking from sleep. One possible workaround is to make the SSID visible, this must be done on the wi-fi router itself and will vary per wireless access point, but if you have access to the wi-fi router it may be a solution. This works for many users, but obviously if you must have a hidden SSID for some reason then making the SSID visible is not always a viable option. Does wi-fi only drop when macOS High Sierra wakes from sleep or screensaver wake? 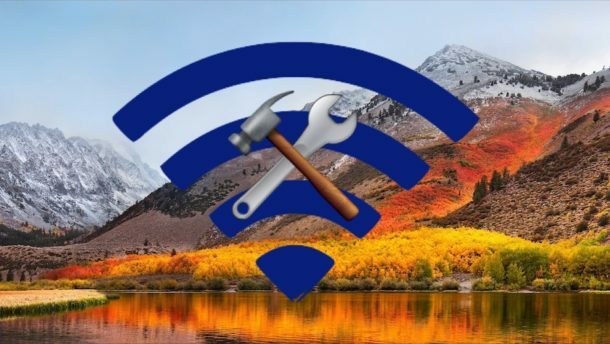 Some users report that macOS High Sierra drops their wi-fi connection when waking from sleep or when waking from a screen saver, or that macOS High Sierra is slow to re-join wi-fi after waking from sleep. 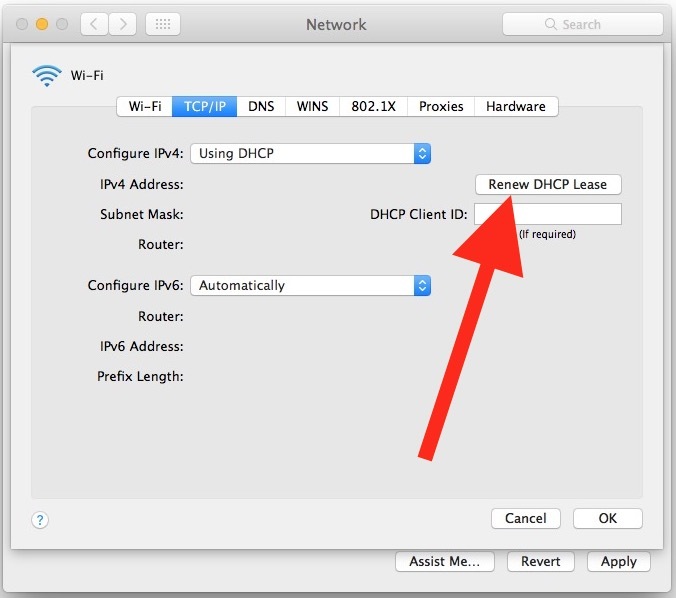 You may be able to resolve wi-fi dropping after a Mac wakes from sleep by following the steps outlined below to create a new wireless configuration. Sometimes simply toggling the wireless capability off and on again is sufficient to resolve an inability to rejoin a wi-fi network. Some users are also reportedly turning off wi-fi before they sleep their Mac, and then enabling it again once their Mac is awake. Another possible workaround is to use caffeinate at the command line, or an app like Caffeine or KeepingYouAwake, or sleep corner, to temporarily prevent sleep while those functions are activated. This is obviously not much of a solution if you must sleep a Mac. Of course, workarounds are inconvenient and they are not true solutions. If you’re experiencing wifi connection problems then try the steps below to potentially resolve them. Back up your Mac before continuing, these steps involve removing system level configuration files. Do not proceed without a backup made so that you can roll back if something goes wrong. Essentially what this is doing is ditching your old wireless preferences and causing MacOS High Sierra to replace them by generating new wi-fi preferences. For many users, this is sufficient to solve any problems with wifi networking. 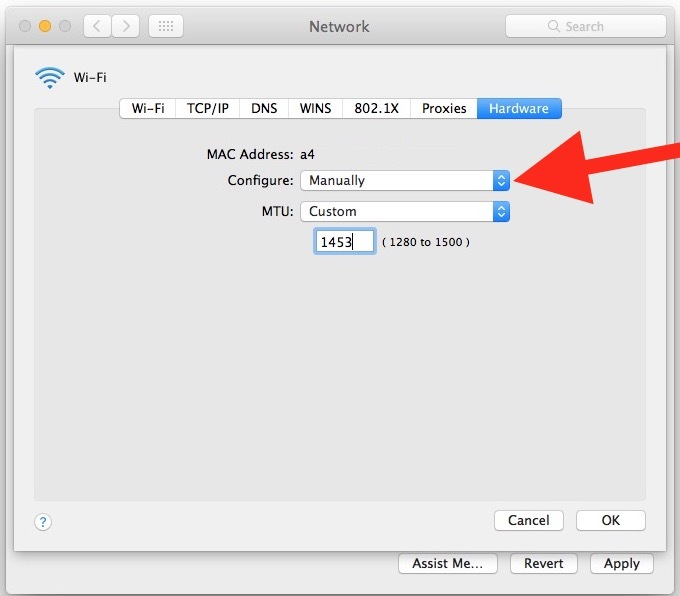 If you’re still having wi-fi problems after ditching the preferences and rebooting the Mac, you can try the steps below to create a new network location with custom configuration settings. 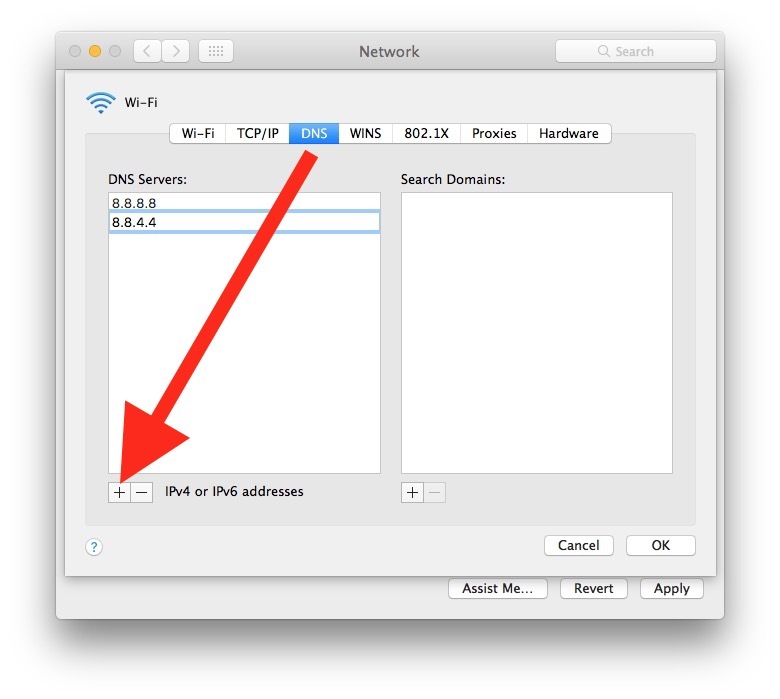 This sequence of trashing wi-fi preferences, generating new wireless preferences, and then, if need be, creating a new network location with custom DNS and MTU are a longstanding set of steps for resolving various wireless problems in many versions of Mac OS, including Sierra, El Capitan, and before. High Sierra Wi-Fi still not working? Connect a completely different device to the same wi-fi router, does it work fine? Did you have any problems with wi-fi in macOS High Sierra? working fine for you in macOS High Sierra? Another option is to wait to upgrade until Apple gets its act together. I don’t know how many times over the years they’ve released a new OS, and there are wi fi issues. Too many. Apple’s flaws only get worse with each passing year. Its golden years have sunsetted and most likely you won’t be getting the fun and functional experience Apple was once known for. Think of Apple as an American car company – was once great but now it’s just a shadow of it’s former self selling mediocrity with a sole focus to reward shareholders. I agree. The focus clearly has shifted to the investors and shareholders. The board represents them and they are making the decsions. Updated to High Sierra and immediately I got wifiproblems. Attached a cable but it is extremely annoying to see that wifi drops each and every time and nothing helps (no new config, trashing pref-files etc). In this time and age, unbelievable. I was unable to post on an Appleforum. Kaiser-attitudes are growing. The same attitude with the anti-glare coating. How many years in a row does this problem persist? I have been using a macintosh for more than 20 years. And I am consolidering switching to another platform as condescending apple has no respect for its customers or users that need to use their machine day in, day out. Just try it without wifi.. writing an article, replying mails, searching the web.. And you need to restart or use an usbfix. I have been trying to fix my WiFi all day. All my other devices are working accept the iMac with Mojave. Since I upgraded to this is WiFi connection always fails after trying all the suggestions on the internet. I am tired of fixes telling my to update. Or like above wait till a new release. How are you going to upgrade to a new release with no WiFi. Their has to be a solution! Please help. This mambo-jambo should really not be required. If it worked before, it should work now as well. Agreed, but sometimes it appears that wifi preferences get toasted during a system software update which then lead to wireless issues. Usually just ditching them and starting over resolves the problem. It seems like this happens to some users with every major system software update, it’s certainly not unique to High Sierra. This is simply incredible. When you multiply the number of workarounds by the number of users by the value of their time to the enterprises it is probably billions per act of stupidity. Worse medical offices can not respond, Parents do not have access to information. There’s an old Northrup ad totally saturated black page with shinny steel ball bearing – simplicity is the ultimate sophistication. It’s time for Apple to stop treating its customers like a pack of zombie gameplayers with nothing to accomplish tomorrow morning. Thank you. Can you now find a way to get back the Guest option on the Login screen? Mine has disappeared with the new OS, and I can’t get it back through the System Preferences. I liked having it available so visitors could do their homework, job applications etc without me having to worry about them changing my files. System Preferences – Users & Groups – authenticate by clicking the lock, then select the Guest User Account in the left hand pane, then check the box “Allow Guests to Log In to this Computer”. I downgraded to Sierra, and now my Mac works fine. Just disable airdrop using “defaults write com.apple.NetworkBrowser DisableAirDrop -bool YES” in Terminal and all problems of WiFi will go away. Log out. Login. All good. Disabling AirDrop will disable AirDrop, it will not solve wifi problems. Think about it. “Down” grade to 10.12.6, all problems gone. Now no video bugs, I can see the login screen, Mail works, no stupid finder problems. 10.12.6 is faster than 10.13. Oh and Server is a server again, iOS/WebDAVS support, SMB sharing without guest access enabled. Apple have lost the plot, concentrating on rubbish with over priced phones, watches and TV programs, all the rubbish to complete the illusion! Thank you! This solved my problem. For now. It’s always something with Apple. You know a company has lost its way when even a Genius warns you never to install a new os within the first 6 months of its release (true story – and that was 3 f*cking years ago. You’d think the company would have its act together by now). P.S. – why are we forced to listen to Rhapsody in Blue when viewing this page? Really annoying. I just fix it the issue at the moment Turing off the bluethoot. now the wifi is always connect and works properly ! Deleting a kext file from some old internet protection software (NetNanny) MAC did fix the problem. From Finder, select Go, and type in Library/Extensions. You will see kext files there. This worked for me after trying lots of other things. I just added the DNS entries listed above, previously had just 1.1.1.1, and it’s working like a champ. BTW – don’t listen to the advice about making changes on your router like creating new SSID. There’s nothing wrong with the WiFi it’s a MacBook issue. Thank you for providing these instructions. I just applied “add a new DNS” fix and it seems to be working. Need to give it a day to see if it is indeed fixed. Thank you so much! Not sure if these all in one ports are the best solution. The following worked for me on two MacBook laptops! Then delete all content in these folders. Restart mac. Speed increase was from 2mbit to 78mbit on an a new mac and from 8mbit to 76mbit on laptop from 2011 on a wifi with 80mbit max download speed. If this works for you, this article can be updated ! I downloaded the Mac High Sierra yesterday and have had constant Wi-Fi drops ever since, one even lasting an hour! I simply could not get back on! Beyond frustrating when you have a project to complete in a short timeline. Unacceptable from Apple. I have tried all of these solutions and even most of the solutions in the comments, yet my 2017 MacProBook has trouble retaining a connection to a wifi that all the other non-apple devices stay connected to easily. Usually the ProBook connects, and after 5-20 minutes of operation disconnects and cannot connect anymore… I don’t know what to do. I can’t go fiddling around with the routers as no one else in the office has the same problem. Have found a solution- am going to Currys/ Pc world to buy a Windows laptop and will dump my useless, pointless and irrelevant MacBook Pro in a drawer until Apple decides to stop peddling garbage to its customers. Simply unfathomable amateurish nonsense – this on top of all the obsessive-compulsive tax dodging from the richest company in the world make me not want to come back. I HAVE WORK TO DO AND CANNOT DO IT. I have a Mac mini and am having a myriad of problems since I upgraded to Hi Sierra. Biggest problem is connecting to Wi-fi. I tried ALL of the suggestions and nothing works. I don’t know what to do next. I am able to use an unsecure Wi-Fi network (a neighbor’s I think) but I would prefer to use my own secure network. I don’t know what to do next. Oh, other problems include slow internet, no notification banners, occasionally receive error message when I delete a file, sometimes I have trouble closing a page/file and it grays out and I get a spinning symbol and it just hangs. Any suggestions? I don’t understand how this fails. I have a MacBook Air that has no issues at all with high sierra, but my iMac just won’t work, regardless of what I do. too Strange, I even tried copying all the network files from the Air to the iMac, but even that did not work. I even can’t understand why only some MacOS High Sierra. And also only in some routers. OF Course that’s a compatibility issue, but no make sense you have a computer that works by a chance, when it wants, and no update to fix from the manufacturer. I tried all these tricks but no way to works as should. I wait until end of year for a fix, otherwise my only option is downgrade. I had two SSID with the same name and pw; one 2.4ghz and one 5ghz. During boot up my iMac won’t find any of the saved wifi addresses. Once I run the script it connects, but after my screen saver is activated or it goes to sleep, on wake up my iMac identifies (actually See’s) the Wifi addresses, even my hidden network, it just refuses to connect to them without a manual push. Too bad I can’t just copy the settings from my mac book air or mac book pro, both of those work without issues. I think the programming error is made with machines that have both en0 and en1 devices, not ones with just a wireless connection, both as default and only connection. If it’s any consolation, I seem to have run into this every year or so through several upgrades–and without upgrading. I still have Sierra (10.12.6), and wireless just started dropping again. I can work around it for a while by changing SSIDs, but this morning I couldn’t stay on any of 4 SSIDs. So I had to go through and delete my preferences and delete my location and all that. While I understand that in-place upgrades can cause unexpected issues (I’ve done a lot of them), for the most part MacOs/OS X has handled them reasonably well. Apple however does need to get their act together on this, and a number of other issues. Also suffering from network instability immediately after “upgrading”. In my case, not only is the Wifi connection lost repeatedly, but even a wired NIC connection is going up and down. Trying to contact Apple support, but only ever get a promise of a chat session that never seems to materialise. Maybe I should investigate taking legal action to recover lost earnings due to wasted time? The most common issue in this scenario is that we all have MC and upgraded to “High Sierra” .. Really Apple its probably juts hypoxia. WTF. I have tried all of the above, nothing works other than re-logging into my network every time my 2011 iMac wakes up. The upgrade worked fine on my 2012 MacBook, but the iMac fails every time. The thought of downgrading the OS is nauseating – if they didn’t test something this obvious, how was the testing on the OS downgrade? How on earth could nobody at Apple have noticed this? Elder Mac Book Pro (2011 or older) with 802.11an card has no problem. Old Mac Book Pro (2013-2016) working ok with up to El Capitan (10.11.n) where drivers are Core WlanKit 11 or older. If the drivers are Core Wlankit 12 or newer ( Sierra 10.12.n ) it works crap. New Mac Book Pro (late 2016 with touch and newer) Works ok with Sierra and really good with High Sierra 10.13.n! HP with Intel AC card has no problem at all. Expected speed at speed test and not a singel ping loss. Running 4×6000 ping to default GW, Server on next net, 8.8.8.8 and the AP on same net as client. Comparing to updated 2013-2016 MAC has more than 20% loss to all of them. – Don’t update a older Mac to more than El Capitan (10.11.n) and skip updates for hardware. – Update a New Mac Book Pro (late 2017 or newer) to latest MAC OS. ( to day 10.13.3 ). I have late 2016 MBP and I have a very specific issue which I haven’t seen discussed here: my laptop simply rejects the correct passwords for some networks. I haven’t managed to connect even once to my work wi-fi, I get 50/50 on my home network (only for 5GHz) and around 90% success on my iPhone hotspot (which is oddly 2.4 GHz). On top of that, it occasionally disconnects, it doesn’t hold on to the connection when it’s asleep and etc., but this was mentioned in the comments here. weird problem just started for me recently … when I come out of sleep, my Mac (10.13.3 on a Macbook Air) forgets the DNS entries I’ve manually entered, and reverts to the ones from my DHCP server (which is the ISP supplied modem, and I can’t override the default DNS on it). Thanks to http://dosdude1.com I could update my mac mini 3,1 from late 2009 from Maverick to High Sierra. He warned of the possibility that the wifi network card will not be usable after the update with his patcher. This did not prevent me from installing High Sierra. Well guess what the network card is not usable anymore. Ok first I did not mind till I realised that Philips Hue only interacts through a wifi network and not over bluetooth, which I first assumed. I have been searching for wifi dongles that are compatible with High Sierra so far without success. Has anyone found a wifi dongle which works? I am at University and had trouble connecting to the WPA2 Enterprise wireless here. I went through keychain access and tried all options but the 3rd listed to no avail. The solution I found was manually selecting “Join Network” rather than clicking on the wifi account name and only inputting the password. Something about inputting the airport name myself made the computer remember the network. Hopefully this helps some of you. oh my god thanks for this solution. worked for me! I am on 10.13.5 and still having wifi issues. I have tried to get ATT to fix. Some of the techs can but it does not last and has to be done multiple times. I am goint to try the patch above and see if it works. It is sad that a high end computer with the most recent os macOS High Sierra 10.13.5 will not work. Thousands of dollars lost. I hate Microsoft but Apple is going down that road and it is not going to be good. If Apple is the same as Microsoft why spent tripple or higher for junk. Go to Network, select WIFI and then “Advanced”. This worked for me, thanks! I’ve done this twice and saved the changes, but it just goes back to the original numbers. So none of the above worked for me. I have 4 users on 1 Mac and only 1 user was having the issue the message was “Invalid Password” which WPA2 level. What I eventually did was use a USB WiFi dongle to join the network and then remove the USB dongle after successfully joining the network. I then tested by restarting the laptop and waking from sleep. I also switched off and on WiFi from the network interface. I have no idea why this worked. I followed the steps given in this solution, and my wifi problems were solved. Thanks for the clear information, this was a great help. which steps did you follow? Someone please help me. I installed the MacOS version 10.13.6 about a month or so ago. I had some of the usual problems with not waking well from Sleep and randomly disconnecting from WiFi. However, today I discovered that I cannot “Turn On Wifi” … this function seems to have been completely disabled and there is no action when I click to turn on WiFi. So, I cannot do anything online … including connecting to App Store to get a patch update or getting online Apple Help. What do I do? My iMac computer is less than one year old … I can’t believe it is already incompatible with the new update? Try resetting SMC and NVRAM on the iMac, it may be some funky hardware thing. If your iMac is less than a year old, you can also call Apple. It is under warranty. They have support staff that is paid to deal with this stuff and they should be able to sort it out for you if SMC reset fails. This is not fixed, this probably will never be fixed. Apple is not capable of providing a solid solution for a wifi connection. To add insult to injury, my new matebook x pro has no problems whatsoever connecting to my iPhone hotspot, using my macbook pro this is a nightmare. I had this problem after upgrading today to High Sierra. I deleted all those SystemConfig files multiple times, turned wifi on and off, forgot my wifi connections etc. Finally after reading somewhere else, I rebooted in recovery mode and “reinstall Mac OSX. This caused my mac to download Mojave. Good and bad news. The bad news, same problems. So repeated the deletion of all new system config files. FINALLY IT WORKED!!! As you can see with this post!